Despite Java’s incredible popularity, the standard edition of Java is way too big and way too bulky to build wireless applications geared towards devices such as the Palm or cell phones. Sun’s answer to this shortcoming was the release of "Java 2 Micro Edition" (J2ME). J2ME has the potential to be as revolutionary in the wireless space as Java has been in the server space. This is the first book that uses the current version of J2ME to give real code for real applications, including extensive coverage of the new and exciting concept of "MIDlets". 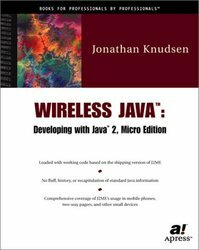 Knudsen begins his comprehensive foray into wireless Java programming with an introduction of J2ME, the Mobile Information Device Profile (MIDP), MIDP applications (MIDlets), and a comparative discussion of the differences and similarities between the J2ME and JavaTM Standard Edition APIs. These introductions set the stage for an ample investigation of the creation of both simple and advanced user interfaces, including demonstrations of how to manage the device’s screen, interact with users through event handlers, and create forms and gather user data. An additional chapter explores MIDlet’s capabilities in interaction with the Internet over HTTP. Knudsen concludes the book with chapters devoted to persistent storage on a device, creating a gaming application, performance tuning, and integrating XML functionality into wireless Java applications.